a naturally occurring, nonessential amino acid, used as a dietary supplement, in biological studies and tests, and in culture media. 2-Amino-3-hydroxypropanoic acid; the l-isomer is one of the amino acids occurring in proteins. /ser·ine/ (Ser) (S) (sēr´ēn) a naturally occurring nonessential amino acid present in many proteins. An amino acid, C3H7NO3, that is a common constituent of many proteins. a nonessential amino acid found in many proteins in the body (e.g., casein, vitellin). It is synthesized from glycine or threonin and a precursor of the amino acids purine, cysteine, and others. It can be found in urine. See also amino acid, protein. A gene on chromosome 11q12-q13.1 that encodes a highly glycosylated plasma protein which regulates the complement cascade by inhibiting activated C1r and C1s, thereby preventing complement activation. C1-INH/SERPING1 deficiency is associated with hereditary angioneurotic oedema (HANE). One of the amino acids occurring in proteins. A non-essential amino acid found as a component of most proteins. It is a precursor of choline, glucine, cysteine and pyruvate. Serine is present in most diets but most of the body serine is synthesized. Fig. 282 Serine . Molecular structure. one of 20 AMINO ACIDS common in proteins. It has a polar ‘R’ group structure and is soluble in water. See Fig. 282 . 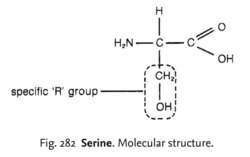 The ISOELECTRIC POINT of serine is 5.7.
n a nonessential amino acid found in many proteins in the body. 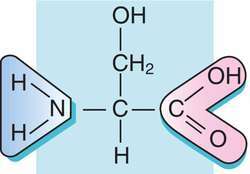 It is a precursor of the amino acids glycine and cysteine. Ser; a naturally occurring amino acid. Kinetics of L-tryptophan production from indole and L-serine catalyzed by whole cells with tryptophanase activity. HSAN1-associated mutant SPT has a reduced preference for L-serine and an increased activity toward amino acid substrates (specifically, alanine and glycine), which ultimately lead to the production of deoxy-type sphingosine bases. Synthesis of GlcCer requires glucose, palmitoyl CoA, and L-serine from glucose. Exogenous L-serine is required for the synthesis of neuronal phosphatidyl-L-serine and sphingolipids. 2000) L-serine and glycine serve as major astroglia-derived trophic factors for cerebellar Purkinje neurons. 2008) Roles of L-serine and sphingolipid synthesis in brain development and neuronal survival. L-Serine induces sedative and hypnotic effects acting at GABA(A) receptors in neonatal chicks. Forty-five CSF samples obtained from 3 groups of patients-chronic pain due to OA of the knees (n = 16), chronic pain resulting from PHN (n = 16), and pain-free participants (n = 13)--were analyzed for D--and L-serine. The Sumichiral column separation of dabsyl D-serine, L-serine, and the D-tert-leucine in the standard and a CSF sample are shown in Fig. 005 mol/L) produced the best resolution for the D- and L-serine peaks and the dabsyl D-tert-leucine internal standard. 3 [micro]mol/L when evaluated on dabsyl D-serine and L-serine calibrators with r > 0. The LOQ values for dabsyl D-serine, L-serine, and D-tert-leucine were 0.